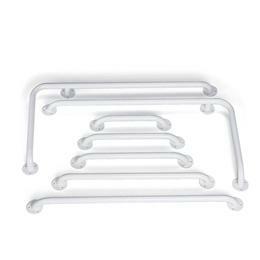 White Enamel Grab Bars: Rugged Enamel-Coated Steel Bars Can Be Used Horizontally Or Vertically And Come Complete With Mounting Hard-Ware. 1.5" Gripping Diameter Bar Complies With Ada Guidelines; 1 1/2" Clearance From Wall. 250-Lb. Weight Capacity. Limited Lifetime Warranty On Frame. Six Month Warranty On Handles, "Wearable" Parts, Grips, Screws. 18" Long.